In this bimonthly series, Jai Arjun Singh recommends Hindi films from the fifties and sixties. 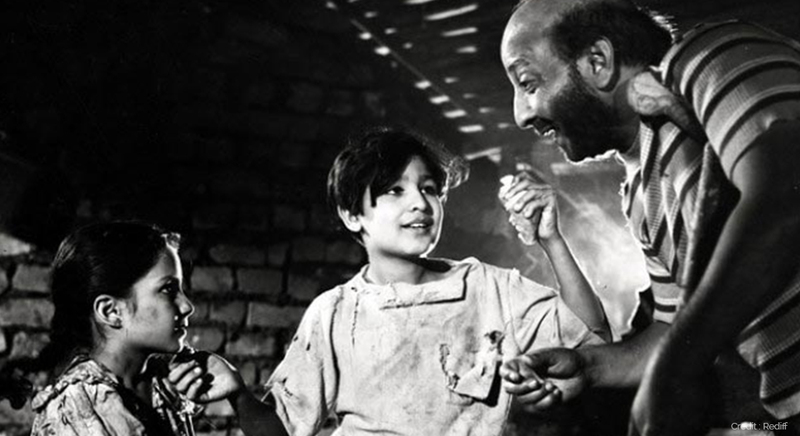 In this instalment, he tells you why you should watch Prakash Arora’s Boot Polish (1954) starring Baby Naaz, Rattan Kumar, David Abraham, Chand Burke. You can watch the film on YouTube. Boot Polish is a Raj Kapoor film, produced by the celebrated actor-director, and by all accounts a project very close to his heart. But it was an atypical RK production. Here, the studio’s trademark images – Prithviraj Kapoor offering prayers, followed by the logo of Raj Kapoor and Nargis striking a romantic pose – yield to a less familiar sight: an illustration of two children hand in hand, pointing towards a dawning sun in the distance. The opening credits then give us the names of the child actors – Baby Naaz and Rattan Kumar – before the film’s title. 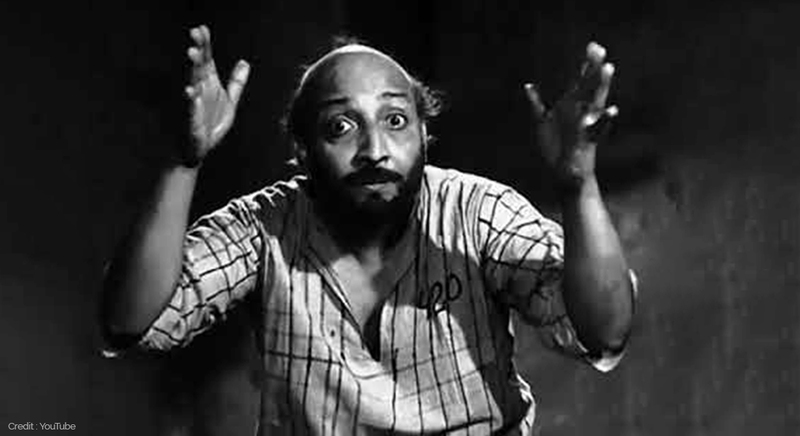 Which is as it should be, for the beating heart of this story is the love between orphaned siblings Bhola (Rattan) and Belu (Naaz), and their contrasting relationships with two adults in the slum where they grow up: the caring John Chacha (played by the splendid David Abraham), though a bootlegger himself, encourages them to be self-sufficient and earn money through honourable work; their shrew-like aunt Kamla Devi (Chand Burke) wants to exploit them by making them beg on the streets. It’s almost inevitable, given this premise and the dominant tone of 1950s Hindi cinema, that there would be a few over-cutesy moments in the children’s (and adults’) performances. But there are also scenes that have the ring of heartbreaking truth, especially when it’s just the two of them on screen, trying to balance principles and ideals (in an innately unfair world) with the hunger in their bellies. It’s almost inevitable, given this premise and the dominant tone of 1950s Hindi cinema, that there would be a few over-cutesy moments in the children’s (and adults’) performances. But there are also scenes that have the ring of heartbreaking truth, especially when it’s just the two of them on screen, trying to balance principles and ideals (in an innately unfair world) with the hunger in their bellies. Baby Naaz’s special distinction prize at the 1955 Cannes Film Festival was well deserved, even if there are times – especially in the musical sequences – where she comes across as a self-conscious, Shirley Temple-like movie star. She and Rattan work so well together that the film’s last 45 minutes, where they are separated by a series of contrived situations, feels like a relatively weak link, though one understands the narrative intent. The children’s aunt is far from a sympathetic character (though the film does allow us to reflect that she too is driven by dire poverty), but there is a quirky early scene where, sending them out to beg, she hums the tune they should use to coerce money out of people’s pockets – and much to our amusement, for a few seconds this woman’s harsh voice becomes imbued with sweetness and melody. Beautiful music at the service of an ugly cause. Very early in Boot Polish, there is a stark close-up of the helpless faces of the children; at this point, you might expect a film from the Cinema Verite or neorealist schools (the title and theme are similar to Vittorio De Sica’s 1946 Shoeshine), but while those elements are present here, this is also very much a Hindi film in the melodramatic tradition. It is episodic and mixes tones, moving from a sad situation to a goofy song that links hair loss with drought. (This is “Lapak Jhapak Tu Aa Re Badarwa”, superbly sung by Manna Dey in Raga Adana.) You can carp about this if you’re looking for an organic narrative; personally, I think nearly all the individual parts work fine in their own right. 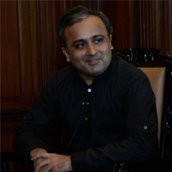 Only a few scenes are built around the boot-polishing profession (we learn, for example, that it’s pointless to go around asking people to have their shoes polished in rainy weather) – this is more of a stand-in for dignity of labour; for the idea that in the New India, no profession should be beneath contempt. “Aaj se hamaara Hindustan azaad hota hai!” the children exult when they save enough money to buy a shoe polish and brush. The film moves towards a too-tidy happy ending, but this also illustrates the thought that if you take even a small initiative in a hopeless situation, fate is likely to smile on you. It isn’t like there are no pessimistic counterpoints. “Kidhar hai yeh nayi duniya? Hum kal bhi bhookha marta tha aur aaj bhi bhookha marta hai,” a jaded adult asks. But the thesis is that this first generation of children growing up in independent India will show the adults by example what the coming world should look like. Many other films made around the same time (like the hard-edged satire Mr Sampath, which imagines a utopian but highly improbable India of the future) were presenting such ideas from different perspectives. Boot Polish is among the sincerest and most hopeful of those films. Because, at the height of his stardom as an actor-director, Raj Kapoor appears here for a few seconds – but doesn’t speak, or even open his eyes! You’ll hear conflicting opinions about whether Kapoor ghost-directed chunks of this film (it is officially credited to his assistant Prakash Arora), but either way he didn’t cast himself in it. There is always something intriguing about a film by a major actor-director where he doesn’t appear onscreen (or doesn’t appear in his most familiar screen persona: like Charles Chaplin in Monsieur Verdoux). Kapoor does show up for a few seconds in his tramp costume, asleep on a train with a cigarette dangling from his mouth. A self-indulgent cameo, or a way of telling his audiences that he was taking a breather for a while?